The everyday life of young Muscovites is becoming increasingly Westernised - and with the summer bringing in the good weather, new trends gain momentum. Moscow has been flooded with all kinds of commuting options in recent years. Residents are fed up with sitting in traffic jams, but using the stuffy and crowded subway is hardly an appealing alternative. As a result, motorcycles, mopeds, bicycles, roller skates, scooters - and even other modes of transportation whose names are not always immediately obvious to this writer - have become a common sight on the roads of the city. Some Muscovites may never get used to the way the beautiful women of Moscow let the wind blow through their hair as they drive their convertibles. And they are even less likely to remain indifferent to the sight of such "fragile creatures" hopping on vehicles traditionally seen as a prerogative of the macho culture - such as motorcycles - or cutting through the lanes of the capital on mopeds whilst sporting killer high heels. Russia Beyond the Headlines discusses means of transportation in Moscow with two girls from the capital. Bayira bought a motorcycle two years ago. An extreme lifestyle is in her nature - she was a finalist in the Moscow boxing championship - and thus she fittingly chose a motorcycle. Bayira rides her bike in the city as well as out in the countryside. Overcoming any traffic jam she encounters, albeit not necessarily at full speed, Bayira knows true manoeuvrability and freedom. For Bayira, her motorcycle is a true friend. 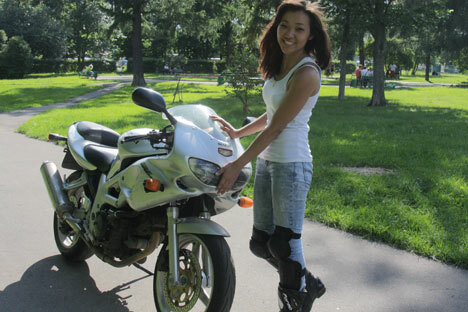 She affectionately calls her “honey” and “my girl”, and laments the impracticality of riding in Moscow any time outside of the May–October period due to the long persistent winter. This is Anya's third season riding a moped, which she finds to be the ideal mode of transportation for such a big city as Moscow. Anya has a bicycle, but she rides it exclusively around Gorky Park on weekends. She brushed aside the suggestion of riding a motorcycle due to the need for a license and the discomfort of riding in a skirt or heels. Nor did speed or the need to wear copious protective gear entice her. As for the shortcomings of using mopeds, Anya could only come up with two - the impossibility of riding all year round due to the weather and the risks of driving on the highway. Anya may not have a nickname for her Yamaha Vino, but her vehicle certainly has its own character - which, in her words, is quite nasty. “In general, having a moped is pretty cool,” Anya concludes. Her friends seem to agree; tempted by her Instagram photos, many of them have bought their own mopeds.